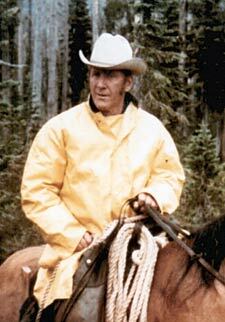 Our horseback riding history in Wyoming. We love sharing Wyoming trail rides! Our love for horseback trail riding has deep roots in our family tree. The Beard family was one of the first families to settle in Teton Valley. James T. Beard, my great grandfather, learned of land to be purchased in Idaho and moved to the Teton Valley. In June of 1900, James took his family and loaded all their possessions into two wagons and began their journey. After a month of experiencing hardships, including problems with Indians, and horse and cattle thieves, they finally arrived in what is still a small community of Wilford, Idaho. Jim purchased 160 acres for $1600. On this piece of property, Jim raised a few cattle and worked at mill sites or hauling coal out of the mines. Business was booming as many people began to homestead in the area. In 1910, Jim moved across the state line into Wyoming. Between the canyon walls of South Leigh Creek, Jim and his boys set up a sawmill and skidded trees with teams of oxen, fell with crosscut saws and axes. The mill site was located at the base of what became known as Beard's Mountain. Time passed and soon Jim's family was grown and most were married with families of their own. In 1931, my grandfather, Joseph Beard homesteaded 160 acres just down the creek from the original mill site. This is where he raised his family, operated the mill and ranched cattle. 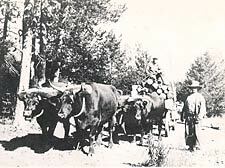 The ox teams were still used but were soon replaced by wheeled tractors. Eventually the oxen became more of a novelty. 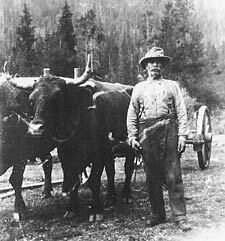 Joe had a way with animals and he especially loved his oxen. Word got out about just how good Joe was with these teams of oxen. Because of this, Joe appeared in several movies with his oxen, including some John Wayne films: The Big Trail, Bad Bascum, and a television series called The Monroes. These oxen are still used today by my uncle and have been seen in modern day western films. They are also featured in the local 4th of July parade! Joe and his boys worked together for several years logging and running cattle until my father, Lyle, discovered another opportunity. In 1962, with his love and knowledge of the mountains and horses, he started the process of becoming an outfitter and guide. Lyle became the first outfitter and guide on the western slope of the Tetons in Teton Valley, making Beard Outfitters the valley's foremost outfitter. By the late 1960s, Lyle and his brother, Billy, had developed quite an organization guiding folks on hunting trips, summer horseback rides, and fishing trips. Lyle's passion for the outfitting business was passed on to his sons, who, together with their father, Lyle, take great interest and pride in offering their horseback guiding and outfitting services. As a participant in our horseback rides, fishing trips, horseback drop camps, and pack trips, you'll experience some of our history in the true tradition of the old west. We look forward to sharing this awesome outdoor experience with you and are confident this will be a long-lasting memory for you and your family. Let's ride!